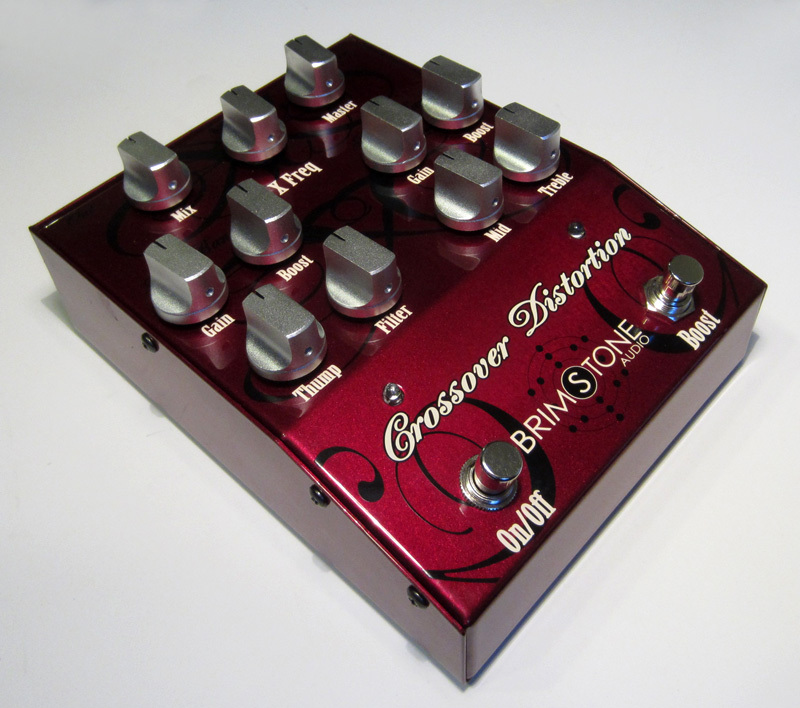 The Brimstone XD-1 Crossover Distortion is an awesome OD/distortion pedal for bass. This 100% analog pedal utilizes a variable Linkwitz-Riley crossover with a discrete mixer to split your signal into two bands with a separate distortion circuit for each band. This allows you to maintain a clean low end, with an overdriven or distorted top end, or vice-versa. It can also be used as a clean eq if desired. Rather than distorting the entire full bandwidth signal and then blending in a clean signal with it, it offers much more control and maintains more low end punch and clarity for us bass players (although it sounds great with guitars too). Even though it has a lot of controls they are very intuitive and easy to use. It runs on a standard 9V power supply or a single 9 volt battery, and there's absolutely no low end loss with this one. The 'mix' knob sets your balance between the two sides (lo and hi). The 'X freq' adjusts the crossover frequency of where the signal splits, and the 'master' is the master output volume. The left (low end) side has gain, boost, thump (deep bass) and a filter control to scoop the mid range content of the split signal. The right side (top end) has gain, boost, mid and treble controls for the pedal's treble content. With all of these controls you basically have endless possiblities of how you want to sculpt your tone. There's also a slide switch on the back of it that pads the input for super high output basses. The 'Boost' footswitch activates the boost control on both sides of the pedal, yielding more gain/distortion. It's a pretty large and heavy pedal, but since it sounds so good, to me its size isn't an issue and it makes adjusting the controls a lot easier than trying to squeeze all of them into a smaller sized pedal.